We’re going to be using BlurAdmin, an AngularJS based application, and the Node based Express framework. 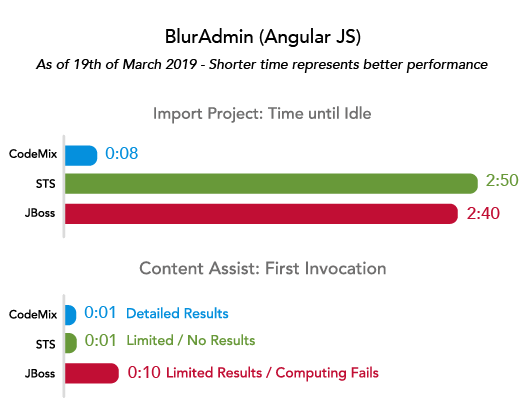 If you wonder why we’re choosing an AngularJS application in today’s world of Angular 2+, Vue and React, it’s because Spring Tool Suite (STS) and Red Hat Developer Studio (RHDS) don’t support these frameworks out of the box. In fact, outside of CodeMix, these frameworks aren’t well supported in Eclipse. 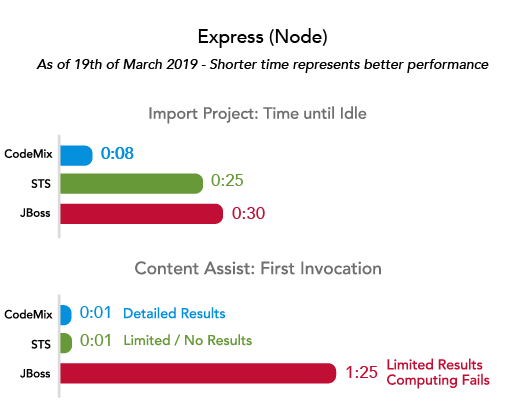 Take a look at the following charts that show how long it took to import the projects, along with the time it took to see the content assist results. Speed is just one reason to love CodeMix, you also get the best of VS Code extensions right inside your IDE! Try something new, like Vue or React. Built-in eLearning makes it a breeze and if you need help, Live Chat is just a click away. While RHDS can take a while to provide suggestions (see chart above), it eventually gets there. CodeMix provides suggestions instantly in most cases, and has the added benefit of providing parameter hints as well. Being able to navigate around a large code base, or even back to the function you were just working on, is an often underrated ability. Sometimes you don’t need to actually navigate to that point, just peeking at the code for a bit is good enough. With CodeMix, press Ctrl and hover to either navigate or just peek. Hyperlink navigation does exist outside of CodeMix, but results vary based on the quality of the created model – peek, on the other hand is MIA. CodeMix takes an intelligent approach to validation, by default, it validates only the file being currently edited. If you want it to validate the entire project, you can change the settings to achieve that. Now, the pièce de résistance, is our build pipeline support, with which you can utilize external tools for building and validation, and see the results directly in your editor. By using the same tools you would normally use to build your application for deployment to production, you are guaranteed to have an experience that is consistent between your dev and production environments.